Edorble, a relatively new startup that seeks to "make online learning personal, playful, and painless," has recently begun working on integrating virtual reality into their already compelling educational platform. After trying it out a bit, I can definitely start to see a vision of the future where Edorble and similar apps play an important role in distance learning. According to the National Center for Education Statistics, more than half of public high schools had students that were enrolled in distance education. That number is almost 5 years old at this point and has almost certainly increased. As students and parents flock towards online and virtual learning experiences, it is important to find ways that can integrate some of the most valuable components to education that can easily become lost in a non-traditional setting. Enter Edorble. With Edorble, students around the world can meet in a private and common virtual space that allows for interaction, collaboration, and even direct instruction from a teacher to a group of learners. When viewing new technologies from the lens of a teacher, one universal litmus test starts to form that is a clear guage of its future success in the educational setting: how can this new tool enhance my ability to deliver content and teach concepts to my students? In fact, on occasions when I work with techno-resistant teachers, these are some of the questions I find answering the most. What value does that add to my instruction? What's the point? How is that better than what I already am doing? Edorble's virtual learning spaces clearly illustrate the value that can be added to online learning. Whereas before, students in an online class might never interact or do so asynchronously through forum discussion, they can now do so in real-time. Edorble's proximity chat allows you to hear anyone who begins speaking in your immediate vicinity, just like would occur in real life. Their simple tools allow teachers and students to converse but also access the Internet on giant screens within the world. I was introduced to virtual worlds for the first time back in 2008 when I started working on my graduate degree online. At the time, online degrees were fairly new and many educators were experimenting with lots of different things that would make a meaningful substitution for the traditional classroom experience. Things like discussion forums, online collaboritive tools, skype, and even conference calls started to define ways that an online class could approximate the same level of instruction and communication that existed in a traditional setting. In my experience, virtual worlds were the only thing that even came close. 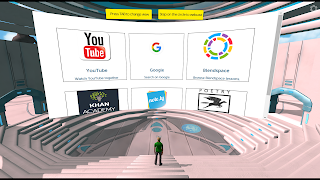 Add VR into the mix along with apps like Edorble that are making it super easy for teachers to connect up with their students, and it is a definite recipe for success. I envision a not too distant future where students and teachers around the world are no longer tied to the physical boundaries of where they live. It is definitely worth checking out the Edorble website to find more ideas about how it works and to download their free software.